Elizabeth Boyd's experiences as the school librarian at Sanford Grammar School from 1961 to 1965. 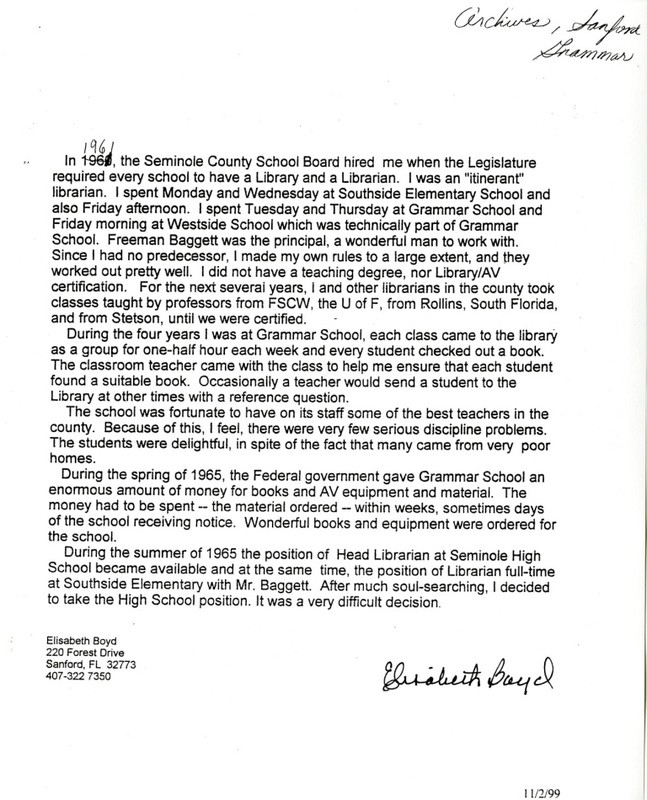 Boyd was hired by the Seminole County School Board in 1961 when the Florida Legislature passed legislation requiring that every public school have a library and a librarian. As an itinerant librarian, Boyd spent half of her work week at Sanford Grammar School and the other half at Southside Elementary School. In 1965, she resigned and accepted a new position as head librarian at Seminole High School. Original 1-page manuscript by Elizabeth Boyd: Sanford Grammar Collection, Archives Box 4B, UCF Public History Center, Sanford, Florida. Digital reproduction of original 1-page manuscript by Elizabeth Boyd. Boyd, Elizabeth. 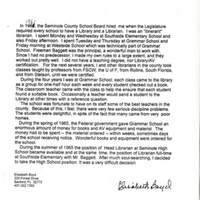 “Elizabeth Boyd's Experiences as Itinerant Librarian at Sanford Grammar School.” RICHES of Central Florida accessed April 20, 2019, https://richesmi.cah.ucf.edu/omeka/items/show/4700.